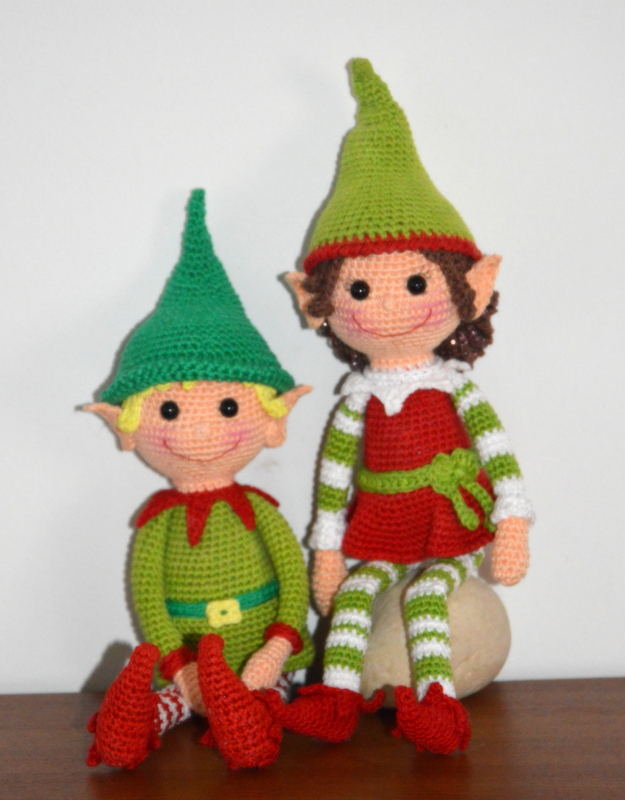 Presenting you the Christmas Elves pattern! Furthermore, there really are some wonderful free Elf on the shelf crochet patterns available, and if you are really looking for one of them I am sure you have already started making some of them. If not, check the Raverly or Pinterest and get your free pattern soon. For those that prefer nice house elves, that will bring you smiles and cheer your holiday season try making one of these little guys. Make them as colorful as possible. These are happy elves and love to be dresses in crazy and bright holiday colors. Less talking and more working! Pattern is pretty long so I better start on with it. I tried to write as detailed as possible. Included as many photos as I could take. I know there will be some that will need more clarifications, so please do not hesitate to write and ask. If I missed anything I apologize in advance, as well I am sorry for any flaws or mistakes that might got on the way. Let me know if you encounter them and will make correction a.s.a.p. Gauge: 8 stitches by 8 rows in 1×1 inch (2,5 cm). Try to obtain the gauge when working head and body. htr – half treble crochet stitch (yarn two times over the hook, insert hook into the stitch, yarn over and draw through the stitch. Now having 4 loops on the hook. Yarn over and draw through two loops . Yarn over and draw through remaining loops to finish the stitch. if making doll with lots of stripes on legs, arms, or even the body and/or hat, try this to make color change less visible as possible. Change color on the last stitch of the previous round (having two loops of one color on the hook, grab second color and draw through these loops to close the stitch). Now slip stitch to the back loop of the next stitch. Make single crochet in the same stitch where this slip stitch was made (now making the stitch through both loops-as you would usually do). Continue crocheting the round. When reaching the end and starting new round, skip the slip stitch. Place eyes now. Use middle round between R14 and R15 leaving 6 stitches between. Make sure the nose comes in the round below them, centered between both eyes. stuff this part and continue stuffing as you go. Stuff arms light. change color to one you will make sleeves. tie off leaving long end for sewing the arms later. pull the left over yarn from forming magic ring and tie a knot inside the top of the shoe (make sure to direct the point where your last stitch of the last round is) to make the shoe tip keep desired form. before continuing with edging around the shoe, you might want to add yarn for the leg. Slip stitch to one of the back loops of R21; *dec x1, sc x1* x6 making 12 sts round. skip 2 sts on R21 and slip stitch to front loop of the third st.
R23: sc to each of the front loops left on R22. Your work will look as *ch1, sc x2* repeated around. Here are few photos that might help you understand the shoe pattern little bit better. stuff the legs as you go. Add little stuffing. Make legs nice and soft. Flatten the top of the legs, right beneath the body and sew across. This will make your elf sit better. place legs side by side, both facing same direction. R1: sl st to one of the inner stitches on one of the legs. Ch3, sc to opposite stitch of the second leg. Once legs are connected with the chain single crochet around making total of 30 sts. From the mails I get from many of you, connecting legs seems to be the nightmare to make. Here are few photos on how to connect legs with chain in between. Hope it’ll help! tie off leaving long end for sewing body and head together. Stuff body nice and firm. slip stitch with the same color yarn used for the body, to one of front loops left on R12. tie off and hide end. make a chain (I used 42 chain stitches for both dolls, but make sure to measure the length and add or decrease stitches accordingly. To make belts look nice, work the loop you’ll find on the back side of the chain. It is one single loop, pointing up and standing in between two loops. Using this loop, your belt will look the same on the bottom and top. For male elf I used single crochet and for girl I worked with half double crochet across the chain to create the belt. Use the stitch you like better. Stitch across the chain and sew end around doll’s waist once done. You can sew across stitch or two on the body to secure the belt stays in place. Shape the square with your fingers pointing chains out. Glue the belt bucket on the belt. close the magic ring. Tie off but leave enough yarn to wrap around bows middle and for sewing later. ch18, starting from the the 3rd chain st, hdc1, sl st next 13 sts, hdc last, work around chain to slip stitch to 1 st and finish nicely. Hide ends in the back of the bow. Tie this lower part on the back of up bow part and sew them or glue them on the belt. don’t close the ring completely. Leave it half opened for easier working. R2: ch1 turn, fpsc x6, sc x3, sl st x1, sl st to magic ring. Ch1, turn. R3: skip 2slip stitches of the previous round, hdc4 to next st, sl st x2, sc x2, hdc x1, dc+htr to next st, make picot of 2 ch sts on htr, hrt+dc to the next st, skip one and sl st to last st. sl st to the base of the first stitch made on this side. Tie off leaving long end for sewing. Close the magic ring and shape the ear nice. R3: sc to first st, dc+htr to next sts (make 2ch picot on htr), htr+dc to next st, hdc, sc x2, sl st x2, hdc x4 to next sts, sl st last st and base of the first st made on this side. Close the magic ring and shape the ear nice. To make your ears nice, use fabric hardener (starch or sugar water). Model the ear while damp and let it dry completely. For extra touch and better look, sc around to all front loops left undone. (same as what we did on shoe). For girl. Started with single crochet and in the second round added 1 ch stitch between each stitch on the bottom line. Work with 2,5 mm hook (if working with different size hooks than 2/2,5 use half size bigger hook from one you used to make the doll). I started the hat from the bottom and crocheted to top. You can do either way. Important is to start stitches you can divide by 5 or 6 for easier counting. On top, to make hat narrow and pointy, you can work 3-4 rounds. Middle part of the hat decrease every third round (example: having 42 sts one round -either after decreasing or increasing previous round, next two rounds sc same amount of stitches. In this case it would be 42. Following round either decrease or increase – depending if you started from bottom or top of the hat). My hat started with ch45 (slip stitched last to first chain stitch to form the ring and continue in spiral). tie off leaving long end for sewing. Thread the needle and close last round nicely. Hide the access yarn inside the hat. After I finished with the hat and green yarn, used red to make the edging. First I single crocheted bottom line and in next round used reverse (crab) stitch all around. If you’ve noticed, top of the head is little folded on the side. I achieved that by decreasing R20 and R24 repeatedly. Instead of normal decrease dec1,sc2… I did dec5, sc remaining stitches. I didn’t write it in the pattern, because to me it doesn’t look anything special. I think normal decrease, all around would look same way. For the dark brown hat I don’t have the pattern but will try to describe what I did to get this nice shape. Again started from the bottom. This time I made 50 stitches chain, slip stitched last to first and worked in rounds. Same as previous hat. This one was divided by 5 for easier counting the stitches and rounds. then decreasing started; first was *dec1, sc8* x5, followed by two rounds of same stitch count, and second decrease was *dec1, sc7* x5 followed with two rounds of same stitch count again. From this part on I made decreases on half of the hat only. For example: if the round was 40 sts, I made those 5 decreases on half of the hat, or just over 20 stitches. Tried to count to apply them as evenly as possible on this half. After decreasing round, followed 2 repeating rounds of the same stitch count. This way I worked all the way it was possible to count and work decrease on the half of the hat. Finished with 5sts, and repeated this 4 times before closing the last round. Important is that decreases are at the same part of the hat. This way the hat will curl naturally. If I will have time I will try to write down exact pattern for this hat. It is really nice one. I am also sure that many of you will be able to make such hat without my help. Decrease on half of the hat evenly (every third round)! That is all the magic there is! Bottom of the hat; slip stitched to first round. Single crocheted 50sts 3 times and 4th round finished with reverse (crab) stitch. These 3x repeating and reverse stitch at the end made hat curl naturally at the bottom what added extra charm to this little pixie hat. from next round do not chain1 but turn each round. Skip 1st stitch and make decrease (2nd and 3rd st). Make one decrease at the end of the row. Do not chain but turn and continue decreasing at beginning and end on each row, or until you reach 3 sts row count. Close the magic ring now. repeat this from R13 one side all the way around side and bottom to R13 opposite side. This will create little hairs on the back of the head. Try making them little longer if you’d like. Ch5 or 6 instead of 4. Will look even better than these short ones. Glue the base of the hair first. Place on the head and pin all around. After hair is placed and pinned, arrange the hairs in front of doll’s face. Two longer hairs place right in front of the ears and fringes arrange the way you like. You can glue these hairs or sew them. Which way you prefer. Back hairs, short ones done last, leave as they are. Loose and free. They will shape the head and give extra touch to your doll. From now on decrease x1 at start and end of the row. Ch1 and turn when starting new row. Slip stitch to side on R13; ch40 and sl st to next side stitch. Work this way on both sides of the hair. From the photo you can see I worked only the sides. You can work all the way, including the bottom row of back of the hair, and even the upper rows. You can chain more stitches in order to create longer hair, or make shorter ones. I added few photos of some hair styles that crossed my mind. Might give you an idea of what hair style to make for your doll. I hope you will enjoy this pattern and the company of your own little elves when done. I wish they bring you lots of joy and happiness during holiday season. …while my elves were coming to my house from far away North they met someone special on their journey. This little fellow was lonely and very sad staying all alone in distant frozen lands. My elves felt sorry for this little one and asked him to join them. He accepted invitation with great joy. Adorable!! Thank you so much for the patterns! !